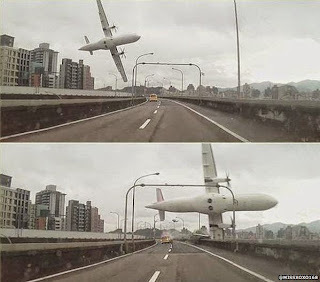 The Taiwan Plane Crash today, February 4, 2015, involving TransAsia Flight GE235 was captured on video. The plane, which was carrying 53 passengers and 5 crew, hit a bridge first before crash into a river in Taipei, Taiwan just 3 minutes after takeoff, CNN has reported. The video was captured by a dashcam from a passing vehicle and it was also shown in the newscast by CNN. As of this posting, 31 passengers have been confirmed dead by TransAsia Airways in its Facebook Page. 15 were able to survive, including a baby, while 12 are still missing.